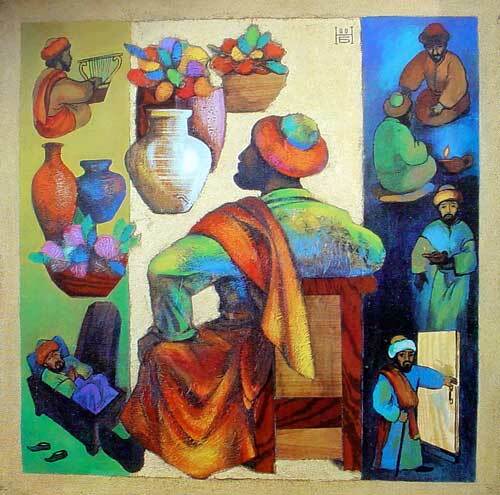 "The Rich Fool and the Watchful Servant" by Kazakhstan Artist Nelly Bube. Verses 1-12 are addressed by Jesus to a crowd and the disciples. He warns them about the Pharisees, that they should not fear those who kill the body and that they must be ready to make a good confession about the Son of man before men. Our text, verses 13-21, an interruption by a man in the crowd, warns against the sin of covetousness. Verses 22-34 again addressed to the disciples, continue the warning in verses 13-21 and speak about the sin of worry and anxiety and how to combat it. The remainder of the chapter, still addressed to the disciples, stresses preparation for the second coming of Christ. Summarized, this chapter speaks about the sins of hypocrisy, greed, and worry. Verses 31-32, concerning the Kingdom of God, stresses the great antidote for all these sins, the Gospel of Christ which gives us an unfailing treasure in heaven. Luke 12:13 Someone in the crowd said to him, "Teacher, tell my brother to divide the inheritance with me." Jesus had been speaking of lofty spiritual matters in verses 1-12, but this man, obviously oblivious to what Jesus was saying, approaches Him with a personal, material request. He calls Him "Teacher" which is "Rabbi." That's all he saw in Jesus. Just what the problem concerning the inheritance between him and his brother was we don't know. Evidently he feels he had been unfairly treated. We need not know the particulars to understand the text. Luke 12:14 Jesus replied, "Man, who appointed me a judge or an arbiter between you?" The use of "man" here is clearly a sign of displeasure on Jesus' part. "Judge" is one who decides the merits of a case, and "arbiter" is one who divides the inheritance. Jesus would be neither. Some commentators point out that often Jewish Rabbis decided in such cases. But Jesus was more than a Rabbi. Lutheran commentators point out that Jesus is here plainly stressing the separation of church and state. He came to save people, not to act in a governmental position. Look at Luke 20:25 and John 18:36. Jesus is implying that there are others in a purely governmental position who can adjudicate such matters. He is not here for that purpose. No one appointed Him as judge and divider in such matters. Luke 12:15 Then he said to them, "Watch out! Be on your guard against all kinds of greed; a man's life does not consist in the abundance of his possessions." Jesus is speaking to this man, to the crowd, and to the disciples. The words mean: "Beware and guard yourselves against every form of greed." The Christian must fight with the flesh. He can do this because he has the shield of faith and therefore his spirit fights with his flesh. Other translations: "For even when a man has more than enough, his wealth does not give him life." "Even if you have more than enough, your property doesn't give you life." "Life" is not eternal life, but this earthly life. Some people delude themselves by thinking that the attainment of some earthly goods will give them life. But, the greedy are even more deluded in thinking that their excessive wealth will surely give them life. Luke 12:16 And he told them this parable: "The ground of a certain rich man produced a good crop. Jesus continues to talk to the same group as in verse 15. The following is plainly called "a parable," a fictitious story to make a point. The man was already wealthy, he really needed nothing else to support himself in this life. "He began reasoning to himself." It is a thinking and debating which is solely on the sinful human level, devoid of faith and spirituality. His only grief is that his store houses are not large enough. Note that he calls the crops "his." God is given no credit. Luke 12:18 "Then he said, 'This is what I'll do. I will tear down my barns and build bigger ones, and there I will store all my grain and my goods. In verses 17-19 the man mentions himself at least twelve times. It is nothing but "I," "I," "I." Note that in his estimation, everything depends on himself and everything is his, and so he speaks. He treats his soul as his very own. "I will say to myself, 'Man.'" "I will say to my soul, 'Soul.'" He is implying that the immaterial part of himself (soul as opposed to body) is under his own control. He will "take life easy." The rich man considers himself his own god. "Enjoy yourself." The rich man's hoped for ease and joy were totally materialistic. The same words are used in Matthew 11:28 and Luke 15:24, but for an entirely different easy life and joy. A fool is a man devoid of even good thinking, much less true spirituality. What a contrast between "for many years" and "this very night." Besser: The end of greed is total bankruptcy. He comes before his judge with a lost name, because God calls him a fool, with a lost soul, because it is torn from him by force; with a lost world, because he must leave it behind; with a lost heaven, because he invested no capital there. Theophylact: From the righteous his soul is not REQUIRED, but he commits it to God and the Father of spirits, pleased and rejoicing, nor finds it hare to lay it down, for the body lies upon it as a light burden. But the sinner who has enfleshed his soul, and embodied it, and make it earthly, has prepared to render its divulsion from the body most hard; wherefore it is said TO BE REQUIRED of him, as a disobedient debtor that is delivered to pitiless exactors. "Whose will they be?" "Surely not yours." Luke 12:21 "This is how it will be with anyone who stores up things for himself but is not rich toward God." Now the point of comparison. "Rich toward God" or "rich in the sight of God." The rich man died a pauper in God's sight despite his great riches. And the consequences in the life to come should be obvious. Jesus, of course, is not saying that wealth in itself is wrong. But He is condemning greed, the desire to have more when one already has enough. 1 Timothy 6:6-10 ought to be read at this point. And the ninth and tenth commandments dwell on the sin of covetousness. They should be studied at this point. And Luke 12:31-34 is very pertinent. Adapted from Exegetical Notes, Series C Gospel Texts, Sundays After Pentecost, by Harold H. Buls, Concordia Theological Seminary Press: Ft Wayne IN, 1979, pp. 33-34. Used with permission.